To further Truman’s growing research reputation, the University has created the Office of Student Research to promote, facilitate, highlight and assess faculty-mentored student research across all disciplines. Matthew Beaky, associate professor of physics, has been tapped to serve as the inaugural OSR director, and is currently in the first year of a three-year term. The OSR will support research in four main areas, including: academic year research; summer research; external funding and grants support; and publication, presentations and publicity. One of the main responsibilities of the OSR will be to oversee all aspects of the University’s annual Student Research Conference. It will also coordinate yearly travel to the National Conference on Undergraduate Research and manage Truman’s Summer Undergraduate Research/Scholarship grants. Additionally, the OSR will assess participation in, and quality of, undergraduate and graduate research opportunities, as well as work with faculty to identify academic year and summer research opportunities on campus and provide a central clearinghouse for students to learn about and apply for these opportunities. According to Beaky, long-term goals, contingent on available time and funding, include the initiation and coordination of a statewide Missouri Research Conference on Undergraduate Research to bring together undergraduates from colleges and universities from across the state. The production of an annual or biannual journal that highlights student research is also a future goal of the OSR, as is the coordination of student travel to regional and national conferences to present the results of their research. The OSR is located in Baldwin Hall 110, and is in the process of developing a website to promote and coordinate student research and scholarship activities. Anyone wanting to contact the OSR can call 785.4455 or e-mail osr@truman.edu. 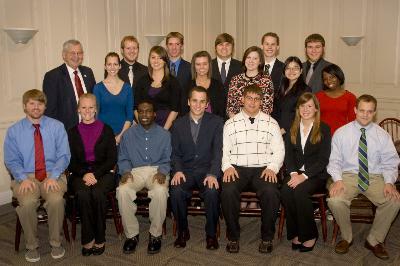 The Spring 2010 Missouri Government Interns pose for a picture with University President Darrell W. Krueger in the Student Union Building. The interns will spend the semester in Jefferson City, Mo., earning up to 15 hours of college credit while working with either a legislator, public official or state agency. Pictured (front row, left to right): Jeremy Tripp, Christi Penn, Michael Cook, John Acker, Daniel Bryar, Tracy Kelly and Gil Carnegie. Second row: Rachel Dicke, Vianey Beltran, Virginia Broce, Casey Millburg, Nancy Zeng and Kiara Cross. Third row: President Krueger, Toby Hausner, Cody Sumter, Ross Carter, Dylan Briggs and Tim Holmes. Not pictured: Megan Coburn. Students graduating this December and their parents can now find information about commencement online. The website, at http://provost.truman.edu/Graduation/index.asp, outlines important information for degree candidates and their guests. The ceremony for nearly 300 graduates will take place at 11 a.m. Dec. 19 in Pershing Arena. Former U.S. Senator, Jean Carnahan, will present the commencement address. Due to the current renovation of Pershing, the parking lot on the east side of the building will be closed. Guests attending the ceremony are encouraged to park in the lots located at Barnett Hall and the lots on the corner of Franklin and Patterson streets. For a map of campus and view of parking lots, visit http://tour.truman.edu/campusmap/. Immediately following the commencement ceremony, the University will host a reception in the Student Union Building for all students, family members, guests, faculty, staff and administration. Several webcams on the Truman Campus provide live views on the Truman website. The Truman Parents’ Project provided the first three webcams in 2004, which show views of the Student Union Building, the Quad and the walkway alongside the library. Residence Life added a webcam in 2005 to capture the progress of construction on West Campus Suites. Todd Kuhns, web services manager, said many Truman alumni and friends regularly check in on the site. “When one of those cams goes down, we usually hear about it first from a parent or alumnus off-campus,” said Kuhns. Kuhns said one challenge to installing the cameras is getting wiring for power and network access to the often difficult-to-reach mounting locations. Nevertheless, plans are in the works to add two more cameras in the near future. To view Truman’s cams online, go to http://webcam.truman.edu. Members of the Truman Forensics Team traveled to Columbus, Ohio, for a two-part competition known as the Holiday Frolic. In Lincoln-Douglas Debate, sophomore Christian Johns led the squad with a quarter finals finish and a second place speaking award. Sophomore Elizabeth Hatting continued the debaters’ success when she received an Octofinalist award. The success continued in Individual Events with three new qualifications for the National Championship in the spring. Freshman Jessica Petrie placed first in Persuasive Speaking, the first time she has traveled with this particular event, and is now qualified to take this event to Nationals. Petrie also placed fifth in Extemporaneous and third in Impromptu. Freshman George Alan also qualified two events at his first-ever competition. He won Novice Impromptu Speaking and placed fifth in Novice After Dinner Speaking. This brings up the team’s total to 19 qualifications. Freshman Samantha Jones received a sixth place finish in Prose, and sophomore Andrew Grojean was an Impromptu Speaking semi-finalist. During the second competition in the same weekend and same city, this time at Otterbein College, the team experienced even more debate success. Johns again received a Quarter-finalist award; Hatting another Octofinalist award; and junior Dylan Clark also received an Octofinalist award. Petrie was the only competitor that made it into a final round with a third place finish in Persuasive Speaking. Anyone interested in competing in forensics should contact Scholten at kscholten@truman.edu. Former U.S. Senator Jean Carnahan will present the commencement address during Truman’s December graduation ceremony at 11 a.m. Dec. 19 in Pershing Arena. As part of the commencement ceremonies, Carnahan will also be accepting an honorary degree on behalf of her late husband who was the governor when the University was renamed Truman State University in 1996. 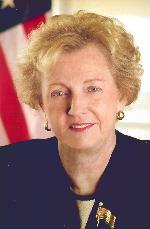 In addition to being the first woman in Missouri history to serve in the U.S. Senate, Carnahan worked with her husband, Mel Carnahan, for 40 years of public service. She played an active role in her husband’s political career. Mel served as a State Legislator, State Treasurer, Lt. Governor and Governor. As Missouri’s First Lady from 1993 to 2000 she worked to improve the lives of the state’s children as an advocate for childhood immunization, abuse centers and on-site day care centers for working families. She was also a champion of the arts and Habitat for Humanity. In 2000, her husband was campaigning for the U.S. Senate when he, their son Randy and a campaign adviser were killed in an airplane crash just three weeks before the election. Voters posthumously elected Mel to the Senate and Jean agreed to take her husband’s place in Washington. During her two years in Washington, Carnahan continued to be a leading advocate for working families. The Senate voted to include her first bill, the “Quality Classrooms Act,” in the “Leave No Child Behind” law. Following the Enron scandal, she introduced the “Informed Investors Act,” which passed into law and required corporations to make swift, electronic reporting of insider trading. She also secured an extension of health care benefits for returning reservists and National Guard personnel. Carnahan served on the Commerce Committee, the Governmental Affairs Committee, the Special Committee on Aging and the Small Business Committee. She was also the fifth woman to ever serve on the Armed Services Committee. Following the events of Sept. 11, 2001, she was a member of the first Congressional delegation to Afghanistan and conferred with heads of state in Turkey, Uzbekistan, Tajikistan, Pakistan and Oman. In recent years Carnahan has been able to watch as her children have started their own political careers and businesses. Her son Russ and daughter Robin won public offices in 2004 and were re-elected in 2008. Russ serves in the 3rd U.S. Congressional District seat while Robin serves as the Missouri Secretary of State. Her son Tom is the founder and CEO of Wind Capital, a wind energy company. The honorary degree is one of three, originally announced in the spring, to be awarded to individuals who played pivotal roles in shaping Truman State University into a premier liberal arts and sciences university. The other two degree recipients are Charles McClain, the long-time school president who envisioned the University’s mission change, and John Ashcroft, the Missouri governor who formally designated it as the state’s only public liberal arts institution. 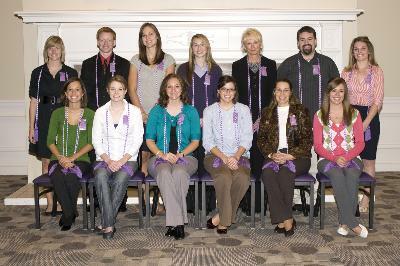 Rho Omega Chapter of Sigma Theta Tau International Nursing Honor Society inducted 17 new members this semester. Pictured (front row, left to right): Emily Reinart, Jamie Menown, Karen Wollberg, Theresa Weinhold, Jennifer Jackson and Jessica Evelsizer. Second row: Elizabeth Brink, Greg Wisa, Kristen Nissen, Megan Laughter, Cindy Carter, Benjamin Hainline and Kelsey Mason. Not pictured: Emily Schroeder, Laurie Brooks, Mandy Doumitt and Mousumi Mukherjee. Truman political science major Tawanda Kanhema won the “Outstanding Delegate Award for Exceptional Representation” of the Republic of Namibia in the First Committee of the General Assembly at the 20th American Model United Nations International Conference, which took place in Chicago from Nov. 21-24. AMUN Executive Director Brian Endless presented the award to Kanhema, who represented Namibia in the first committee and drafted a resolution on effective methods of combating the illicit trade in small arms and light weapons in all its aspects in developing countries. Kanhema’s draft resolution, sponsored by 37 countries, focused on African, South American and Asian countries battling with the proliferation of unregistered arms and proposed the tighter regulation of rogue arms manufacturers. There were nearly 50 universities from five countries (The United States, Venezuela, Nigeria, Taiwan and Belgium) representing 135 United Nations member states across the six committees of the General Assembly. Truman represented Namibia, Finland and Rwanda, and participated in the General Assembly, Security Council, World Food Program, World Health Organization and the International Court of Justice. Kanhema also interviewed the keynote speaker, genocide hero Paul Rusesabagina from Rwanda, and wrote a story that has been published in five international newspapers. To read Kanhema’s article, visit http://investigativezim.com/. 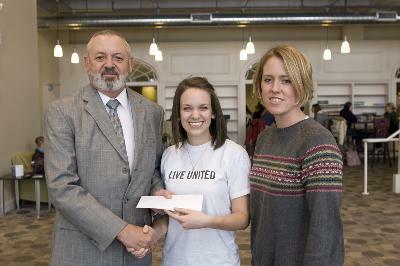 Elise Bailey, student chair for the United Way Drive, accepts a donation raised during the Food Fast fundraising campaign. The United Way of Adair County/Northeast Missouri would like to thank Sodexo and Residence Life for their contributions to the 2009 Food Fast. Students donated meals and dining dollars during the week of Oct. 19. Student Advisers and Sodexo staff played an important role in promoting this fundraiser. As a result of their efforts, Sodexo was able to present a check for more than $2,800 to the United Way. A special thanks is extended to Dennis Markeson, director of dining services, and Emily Haupt, coordinator for student life and development, for their hard work in organizing this opportunity. Pictured (from left to right): Markeson, Bailey, and Haupt. The U.S. Department of Homeland Security HS-STEM Summer Internship Program is accepting applications from undergraduate students with U.S. citizenship for 10-week summer research experiences at federal research facilities. Participants receive a stipend of $500 each week plus transportation expenses to/from their internship location. Deadline to apply is Jan. 5, 2010. Send questions regarding DHS Education Programs to dhsed@orau.org or visit http://www.orau.gov/dhseducationprograms for more. The Institute of International Education has announced the inauguration of the Freeman Indonesia Nonprofit Internship Program (FINIP), funded by the Freeman Foundation. The internship aims to develop student leaders and strengthen the nonprofit sector in Indonesia. IIE will select and pair 10 Indonesian students pursuing U.S. degrees with 10 U.S. undergraduates and arrange internships for them to work together in an Indonesian nonprofit organization. The internship lasts from June 15-Aug. 17, 2010, and will take place in three cities: Jakarta, Bandung and Yogyakarta. Interested American and Indonesian sophomores and juniors enrolled in U.S. institutions are encouraged to apply, using the online application at http://www.iie.org/programs/finip. The deadline for submission of completed applications is Feb. 15, 2010. Contact finip@iie.org or visit http://www.iie.org/programs/finip for more information. The Truman in Washington Program facilitates internship opportunities in the Washington D.C. area. Students can intern in their area of interest by working with Truman alumni, The Washington Center (TWC), or independently identified internships. Truman in Washington helps students locate housing in the D.C. area and provides students with support throughout the internship experience. Most internship programs have specific application processes with strict deadlines. Students also have the opportunity to earn academic credit through Truman in Washington, if they choose. 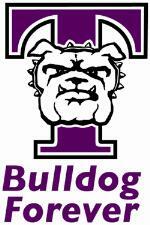 Visit the Truman in Washington website at http://twp.truman.edu for more information. The site includes application materials, cost estimates, photographs taken by past interns and general information about the D.C. area. Applications for internships through The Washington Center are due by Jan. 19, 2010. Contact Diane Tobin Johnson at djohnson@truman.edu or 785.7852 with any questions regarding an internship in the Washington, D.C. area. The U.S. Department of Homeland Security Scholarship Program is now accepting scholarship applications for 10-week summer internships at federal research facilities or DHS Centers of Excellence. Positions are open to undergraduate students with U.S. citizenship. The award includes full tuition and fees and a monthly stipend. Application deadline is Jan. 5, 2010. Send questions to dhsed@orau.org or visit http://www.orau.gov/dhseducationprograms. The following students have been selected for their outstanding academic achievement, character, leadership and service. Upward Bound is seeking a graduate student to work with high school students during the Spring semester. This is a paid part-time position. Call 785.4244 for more information. Free pizza, drinks and dessert will be available. Students will also receive their free alumni gift, T-shirt and alumni information. If students cannot attend the pizza party, they can pick up their alumni gifts and information in McClain Hall 205. Students in attendance can also register to win door prizes. For more information or for special dietary requests, contact Stacy Tucker-Potter, coordinator of alumni relations, stuckerpotter@truman.edu. Supported by: MAC, Student Senate, Missouri Campus Compact and Center for Teaching and Learning. Pre-register online at http://mac.truman.edu by Jan. 11, 2010. For more, contact Nicole Merritt, nrm3413@truman.edu, or Baillie Cloyd, bcloyd@truman.edu. Financial Aid has added the option to participate in a service-learning project in order for students to complete scholarship service hours. Service-learning projects will allow students to interact with the Kirksville community while having the freedom to design and implement projects with the off-campus organization. The objective of these projects is to give students an option to apply what they have learned in the classroom towards a real-world experience. These positions are now available on the Tru-Positions website. Tru-Positions can be found online at https://trupositions.truman.edu. Any questions or feedback can be directed to Tom Stuart at tstuart@truman.edu. Any faculty members, students or student organizations wishing to participate in service-learning next semester can contact Baillie Cloyd at bcloyd@truman.edu or 785.7753 to start discussing potential projects. Service-learning is a wonderful and unique opportunity for students to use their current knowledge and skills to complete a service project for a non-profit community agency. Show your spirit this holiday season! Small and medium sizes are still available for $5 and can be picked up in the Public Relations Office in McClain Hall 101. An information session on the National Security Education Program David L. Boren Undergraduate Scholarship will take place at 4 p.m. Dec. 15 in the Student Union Building room 3203. This national scholarship program is intended for college students who wish to study abroad in world regions critical to U.S. interests. Boren Scholars are eligible to receive funding for summer, semester or academic year programs and are expected to work for one year within three years of graduation in the Department of Defense, Homeland Security, State or the Intelligence Community. For more information, contact Doris Snyder in the Graduate Office, McClain 203, or visit http://www.borenawards.org/. The French Government is seeking English language teaching assistants ages 20-30 to aid English teachers in France’s elementary and secondary schools. The assistantships begin in late September 2010 and conclude in late April or May 2011. The job includes 12 hours of contact per week at civil servant status. Applications are due Jan. 15, 2010. See full details at http://www.ciep.fr, set up an account at http://www.tapif.org, or contact gsiewert@truman.edu. Looking for the perfect gift for a graduating senior? Why not give them the opportunity to network with other Truman alumni and the chance to establish a life-long connection with their alma mater? An Alumni Chapter membership is a great way for new graduates to develop important connections, and Alumni Chapter membership is HALF-PRICE for recent graduates. Truman has 10 regional Alumni Chapters in Arizona, Chicago, Colorado, Dallas, Iowa, Kansas City, Mid-Atlantic (Washington, D.C. area), Mid-Missouri, Northeast Missouri and St. Louis. Membership is only $10 for an individual (regularly $20) and $15 for a joint membership (regularly $30). Additional benefits of membership include free admission to most home athletic events, discounts at Truman bookstores, nationwide hotel and rental car discounts, Kirksville hotel discounts, the Alumni Connections newsletter and more! For more information contact Stacy Tucker-Potter, coordinator of alumni relations at stuckerpotter@truman.edu or 785.4167. Freshen’s and Jazzman’s will be closed through Jan. 10. Planning a Trip? Maybe you want to check out an audio book from Pickler Memorial Library. Choose from 544 titles. Faculty, staff and students may check out audio books for 30 days and renew them online. To view the selection of audio books, visit http://lance.missouri.edu/search~S6/daudiobooks. The Portz Fellowships support original and extended interdisciplinary projects for up to 18 months. Applications are available at http://www.nchchonors.org. For more information contact Dr. Patrice Berger at pberger1@unl.edu or 402.472.5425. Are you looking for a quiet place to study with your group? Stop by the Pickler Memorial Library Circulation Desk and pick up a study room key. No reservation needed. Study rooms have a lab computer with a larger monitor. There is a two-hour time limit. 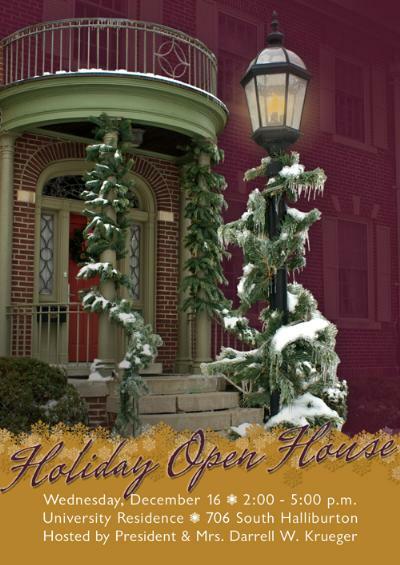 For more information go to http://its.truman.edu/labs/pml312_lab.asp. Dec. 15-16 9 a.m.-11 p.m.
Dec. 17-18 9 a.m.-7 p.m.
Dec. 21-22 11 a.m.-2 p.m.
Jan. 4-8 11 a.m.-2 p.m.
Jan. 10 11 a.m.-7 p.m.
*Specific areas may be closed for periods of time without advance notice for cleaing or contractor projects. Gretchen Smiles, MAE graduate student; Liz Jorn, HES instructor and Cardinal Key adviser; and Baillie Cloyd, Truman’s service-learning coordinator and AmeriCorps*VISTA member, attended the 2009 National Cardinal Key Conference in Atlanta, Ga., in October. Cardinal Key is a National Honor Society that focuses on service and leadership. Jorn was the first adviser to ever attend. In addition, Cloyd was elected as the National President and Smiles was elected as the National Vice-President. Cloyd and Smiles join the ranks of only two other national officers and will serve for the next two years. Their responsibilties include writing monthly newsletters, keeping in touch with other chapters and planning the 2011 National Conference.